The much admired five-cylinder engine which powers the RS 3 and TT RS is recognised once again in internationally judged engine honours. Audi continues to bag awards at the “International Engine of the Year Awards” and for the ninth time in a row, the jury selected the brand’s 2.5 TFSI as the best engine in the 2 to 2.5-litre category. With 400PS, this iconic brand hallmark is the most powerful series-production five-cylinder on the global market. 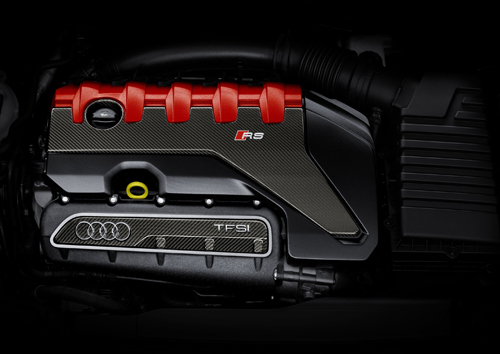 Creating the heart of the Audi TT RS Coupé and the TT RS Roadster, the five-cylinder engine also powers the Audi RS 3 Saloon and the RS 3 Sportback. The 2.5 TFSI allows the TT RS and TT RS Roadster to accelerate from 0 to 62mph in 3.7 and 3.9 seconds respectively, with the RS 3 Saloon and RS 3 Sportback achieving this in 4.1 seconds. The top speed for all four models is 155mph as standard, with the option of increasing this to 174mph. The awards for the “International Engine of the Year” have been presented annually since 1999. An international panel of 65 journalists select the best engines of the year in a number of different categories. This year is the fourteenth time in total that Audi has won the globally renowned prize. Check out our fleet of Audi sports rental cars here.